How to write a Morrissey song. 1. Be Catholic, probably essential. 2. Be incredibly conflicted, guilty, tormented. 3. Write your incredibly conflicted, guilty, tormented emotions into song. 4. Pick up a guitar/play piano and string a few chords together. 5. Be honest, absurdly exhibitionist and yet at heart, really rather shy. Réquiem ætérnam dona eis Dómine; et lux perpétua lúceat eis. Requiéscant in pace. Amen. About 5 or 6 years ago I visited Ampleforth Abbey and thought it was delightful. Here is their schedule of prayer. Getting up at six 'o' clock in the morning seems rather civilised for a monastery! Lightweights! I wonder if they have TLM there. Apparently all the Brothers there train to be Priests and many of them serve the local communities around the Abbey. There are so many Abbeys around the UK. I visited Pluscarden Abbey, which was lovely too, nice chant there, then there was a brief visit to the Abbey of St Michael in Farnborough last week which was very lovely, oh and Worth Abbey for a short stay. Then there was The Friars in Aylesford, who were Carmelites and the Franciscans of the Renewal in Canning Town. I mean, seriously, if you felt called, where on earth would you start?! 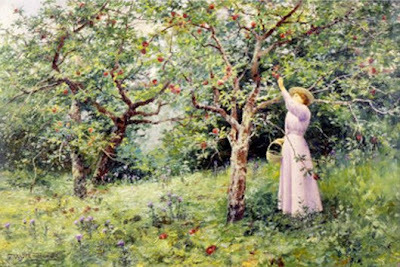 Just posted a children's short story I wrote a few years ago entitled The Miraculous Apple Tree. If you'd like to read it click here. If you know any publishers who you think would like it let me know and actually if you like it, let me know. If you don't like it, let me know, but with charity. If your children like it, definitely let me know! Imagine that the jockeys are the homeless who gather outside my window to have a can of beer and chat and the 'Artist Formerly Known as Prince' is a Community Support Police Officer.' A***holes! Why can't they go out and catch some real criminals? I mean, what do other people pay their taxes for!? Someone Call a Doctor! It's a Theological Emergency! Today is the Feast of St Thomas Aquinas, Doctor of the Church. Doctors of the Church are people whose writing, inspired by the Holy Spirit, builds up the Church, teaches the truths of the Catholic Faith and inspires others to seek the Face of God. The word doctor also suggests their works had some kind of healing or balming effect on the Church. Don't know, the last one's a shot in the dark. Now there's a headline of which the Daily Mail would be proud! I began calling Social Services 'the SS' a while after I left an organisation where we came into contact with them a lot in London. While obviously there were then and there remain now many exceptions to the rule, Social Services are inherently middle class, highly judgmental and often brutish, ill-mannered bureaucrats, unable to look upon people's poverty or misery without looking down on them patronisingly, and who have an uncanny knack of ensuring that all sensitive issues relating to families are tackled in the only way they know how: with a pen, a sheet of paper and some boxes to tick. "Congratulations on a marvellous result. How do you think that went, Ron?" "Well, you know, at the end of the day, I can't complain. The boys gave 110% out there, I can't ask for much more. At the end of the day, there were three altar servers and a Priest out there fighting for Sacred Tradition against the weight of so many stubborn Bishops dragging their feet. We just got into our game and there was little they could do to stop us. I'm proud of the lads. Some of the Bishops were blocking us for a while, you know, they have a formidable defence, a 'magic circle' if you like, but we just kept hammering away at it and in the end, got the result we were after." "But you came away with a cracking result and what a sublime finish at the end there at the 'Ite Missa Est'. Can you take us through that one more time? We've got it here on slow motion action replay." The Iraqi Chaldean bishops have given Benedict XVI the liturgical robe of Archbishop Paul Faraj Rahho and the stole belonging to Fr. Ragheed Ganni. Both men were killed in Mosul, Archbishop Rahho in 2008, Fr. Ragheed in 2007. The gifts were given during the concluding audience for the ad limina visit made recently by the Eastern bishops. The pope received the relics "with emotion," and recalled the "victims of violence in Iraq during these years" - and in particular the two martrys and the many other priests and faithful - saying that "their sacrifice is a sign of their love for the Church and their country." Someone please stop these sick b****rds. Personally, I pledge to raise awareness of the distubring cult of personality that surrounds President Obama and his sickening disregard for human life in the womb. It is adverts like this that lead me to think this guy could be the new Hitler. I laughed out loud when I heard the celebrity who said, "I pledge to flush only after a deuce!" O my, that was classic. And then there's the lady who pledges to "reduce my use of plastic." Well, if she's a Hollywood celebrity she could start with her face! And then there is the frightening mantra at the end of the ad, which really makes you want to punch them and start daubing anti-Obama graffiti all over your hometown. "It's No Good, You're Surrounded, Now Put the Can Down and Noone Gets Hurt"
I can invite a non-Catholic friend to Mass and I don't have to 'hold his hand' to help him or guide him through the responses for the Holy Mass, because the emphasis has been taken away from the congregation's audible participation. If he asks me what he has to do in the Mass I can tell him: Pray. President Barack Obama, still riding the crest of a wave of popularity has in the first week of office signed quite a few 'Executive Orders'. With the stroke of a pen, he assigned Guantanamo Bay to the ignominious dustbin of history to which it belongs and receives adulation and applause. It would appear that the powers of the President have been increased incredibly in the last few years and it is a worrying development. I mean, does no-one ever think, what if the guy was a total nutjob, even more nutty than the last one (I know its hard to imagine) and a serial killer in disguise. A friend of mine was arrested yesterday having been spotted breaching his ASBO in the town centre. There are vast swathes of Brighton in which he is not allowed to stand, sit or walk until 2012. Society has rejected him and the authorities wish to control his movements. His crime? Having a can on the street and begging. Due to his arrest he could face a maximum of four years in jail for breaching his ASBO. So, he could receive a prison sentence merely for standing in the wrong place in town. A bit harsh? Welcome to Brown's Britain. Tonight I went to the first Latin Mass I've attended at St Mary Magdalen's Church. It is the first Mass at which I have not uttered a word...and that is why it is beautiful. It is the first Mass at which I have not responded to what the Priest is saying...and that is why it is beautiful. I came away thinking, yes, that is how it was always meant to be. It is almost as if everyone suddenly knows his place. The Priest is allowed to be the Priest, mediating and interceding on the behalf of his congregation, with vocal and inaudible prayer and entreaty. His assistant, the altar server assists in the responses during the liturgy. A friend of mine called Michael handed me this the other day, his thoughts on the importance of the kind spirited people who run soup runs for the homeless and what life would be like without them. I met an old lady the other day on Victoria station, in the freezing cold, collecting for the Passage, the local hostel for the homeless. We exchanged a few words and I was on my way and it set me thinking, 'What happens to the homeless and those less fortunate, when those old ladies and gentlemen who give so much of their time and energy, can no longer carry on? I do hope there is a place in Heaven reserved especially for them - the special ones! If their legions deplete it is the whole of society that will suffer - not just the buttie and soup runs and the kind words that lift us out of the doledrums - these unsung heroes - carers without reward - should that tradition be lost, then so are we all. Are they a dying breed or are there more coming through? Today was the Feast of St Agnes, Martyr of the Church who was beheaded for keeping her virginity and courageously proclaiming Christ to be her true Spouse. We Catholics have been quite left alone in the UK, the US and the West as a whole for a long while, but the story is very different in other countries in India, Pakistan, Iran, Saudi Arabia, Indonesia, China and many other countries around the World, where the Church is still under daily attack. Catholic Dissent: Do We Need More Of It? A friend of mine has a boyfriend who has been refused bail and is now residing in prison for involvement in a demonstration at the grounds of a firm whose ethics he took issue with. According to my friend he is innocent of taking part any wrongdoing in what took place, but was caught up in the chaos and was charged, simply because he is a protester well-known to the authorities. Catholic dissent seems to be on the decrease in the UK. We have all gone quite meekly into the night when it comes to peaceful, civil protest at laws enacted in the UK concerning Life issues, the Human Embryology Bill and local bye-laws which punish the very poor, such as begging and street drinking. Civil protest is our right and we have a right to have our voices heard when they are not heeded by the political process. On my way to St Mary Magdalen's to do the admin I was accosted by a young man named Stephen who invited me to a talk called, "Evolution: Fact or Fiction" and wanted to give me a flyer for it. I refused politely saying, "Thank you, but I'm Catholic and I listen to the Church." Oh boy! He didn't like that at all! He proceeded to wax lyrical about salvation through being "born again" and through the reading the Bible. Having half an hour earlier prayed the peace prayer of St Francis, I was in no mood for a fight, but he held me for a good five or six minutes trying to persuade me of the error of my ways. 1) There is only one mediator between God and man and that is Jesus Christ. There is therefore no reason for a Priesthood, Cardinals, Pope, Bishops and Clergy. 2) There is no need for Sacraments when you are 'born again,' because it is a "new life in Jesus." Looking for a biog of the life of St Agnes, I found a blog called Sponsa Christi from a young lady who has recently consecrated herself to a life of virginity. What a courageous, faithful and inspiring person she is! St. Agnes was a Roman girl who was only thirteen years old when she suffered martyrdom for her Faith. Agnes had made a promise, a promise to God never to stain her purity. Her love for the Lord was very great and she hated sin even more than death! Since she was very beautiful, many young men wished to marry Agnes, but she would always say, "Jesus Christ is my only Spouse." An understandably nervous Barack Obama stumbled over repeating the Oath of Office when he failed to repeat the sentence, "I will execute the Office of President of the United States of America," only managing to state the words, "I will execute," at which point he had to be prompted and reminded of the rest of the oath. Now, there is nothing to laugh about here, it is just a stumble of a man on a historic occasion on which we all congratulate him and pray for him to live up to the expectations of a weary nation. The deeper underlying reason why I noted his pause and failure to repeat a very simple oath, leaving his sentence unfinished and merely saying, "I will execute," is that the Freedom of Choice Act (FOCA), is the first act he wants to sign in Office. The signing of FOCA will indeed be a watershed moment for US politics, because if it is signed it will consign thousands more innocent, unborn children to death through abortion. The picture above reminds me now of a young man who I saw today who was recently stabbed. Please pray he gets his wound seen to soon, lest it become infected. According to his legend, Sebastian was born at Narbonne, Gaul. He became a soldier in the Roman army at Rome in about 283, and encouraged Marcellian and Marcus, under sentence of death, to remain firm in their faith. Sebastian made numerous converts: among them were the master of the rolls, Nicostratus, who was in charge of prisoners and his wife, Zoe, a deaf mute whom he cured; the jailer Claudius; Chromatius, Prefect of Rome, whom he cured of gout; and Chromatius' son, Tiburtius. Chromatius set the prisoners free, freed his slaves, and resigned as prefect. St Francis of Assisi: Patron of Narcissists? Anyone who knows me, knows I am a big show off. Anyone who started a band called The Astonishing is not going to be the world's most self-effacing person. The sin of abnormal self-love is certainly a problematic one in the Christian Faith because love of self stands in direct opposition to the love of God, who alone is worthy of our love and devotion. The sin of Pride leads the soul into chaos and self-destruction and history is littered with souls whose narcissism was made woefully manifest. Who is in Your Top Ten Saints of All Time? "Is it a bird? Is it a plane? No, its Brother Joseph flying again!" Any Saint who can actually fly has to be in the top ten by virtue of sheer novelty and uniqueness. Died, came back to life, visited Hell, Purgatory and Heaven, got out of her coffin and gave an eye witness account of all three, told the congregation to stop sinning and flew up into the rafters to avoid the scent of human sin. Lived a life making incredible and often bizarre acts of mortification, penance and reparation for the sins of mankind. Holy agony uncle who lived on the top of a pillar praying, preaching, fasting and interceding for his town in all weathers. Befriended a little worm who emerged from his tummy and told him to go back home to his stomach where God's Providence had placed him. b) Invite them in for tea and biscuits. c) Tell them to renounce their heresy and that there is no salvation outside of the Church. d) Politely tell them you are Catholic and believe in the teachings of Holy Mother Church, but thank you anyway. e) Shower the witnesses with Rosaries from your window. f) Tell them there is not enough time to talk as you have to go to hospital for an urgent blood transfusion. g) Tell them you are not in. h) Tell them that you've mathematically deduced that Heaven is probably full now, as there must have been at least 144,000 Jehovah's Witnesses who have already lived and died and now enjoy the Beatific Vision and you fear we are out of time. Click here to sign the pledge to pray to St Michael, Archangel daily for the conversion of souls involved in the abortion industry. This prayer was composed by Pope Leo XIII in 1886 and is offered for the private recitation of the faithful in accord with the decree of Inde Ab Aliquot Annis of the Congregation for the Doctrine of the Faith, September 29, 1985.
contra spirituália nequítiae in caeléstibus. Fr Ray Blake has posted a good documentary on Poverty, Chastity and Obedience which I really enjoyed. I found this one on the 4 Vincentian Vows of Stability, Poverty, Chastity and Obedience, which is also good. For those interested, including myself, Fr Luke Jolly of Worth Abbey was on the radio this morning highlighting that he is running a Compass course on discerning God's will regarding vocations to the Church, marriage and state of life in general. Get 100 'Missionary' Rosaries for just £21.50! White plastic 'missionary' rosary. Price for 100. Circumference: 54cm. Length: 43cm, just £21.50. Click here for more info. What a bargain! Anything the Jesus Army can do, the Church can do also, but only by merit of the fact that the Most Holy Rosary of the Blessed Virgin and Mother of God, came straight from Heaven into the hands of St Dominic, to combat heresy, to defeat sin and error, to lead souls into virtue and holiness and into the arms of Her Beloved Son. Mwa-hah-hah-hah-ha! Mwa-hah-hah-hah! Now, where is my debit card? Ah, problem. No Important Roles for Women in the Church? Think again. Blessed Teresa of Calcutta, pray for us. And people wonder why the Church instigated the Inquisition...I don't blog much on the Anglican Church, what with being Catholic, but the CoE does seem to be like an asylum for crackpot heretics with ideas about Christianity so relativistic that as Bishop Gene Robinson says, it "is uniquely capable of holding two seemingly contradictory ideas together." He says it as if it is a virtue. It isn't. Leaving people utterly confused about truth is not a good thing, Bishop. The inexpressibly important and excellent organisation, Aid to the Church in Need (ACN) are organising a pilgrimage to Walsingham on Saturday 27th June 2009. If you want to find out more about it email ACN at acn@acnuk.org or call 020 8642 8668 or click here for the website. I recently read a report that ACN produced called'Persecuted and Forgotten? : A Report on Christians oppressed for their Faith', and it made for some pretty heavy bedtime reading I can tell you. We don't hear half of it in the mainstream news. The Church is under attack mainly in areas of Islamic militant extremism, Hindu militant extremism and (surprisingly) Buddhist militants. dowry, and upon us who greatly hope and trust in thee. How Should the Laity Evangelise? "Are You Known to Us?"